San Blas Archipelago, also known as the region of Kuna Yala, is formed by 365 coral islands and remains one of the best kept secrets in the Caribbean for sailing charter. The best and most privileged way to discover San Blas is by sailing among its white sand islands and beautiful turquoise waters. Come on board and discover it with us! Day 1: Arrival in the morning of guests in Cartí. We will pick them up for embarkation on our sailboat to start the charter. Visit of a small Kuna village to discover their traditions and craftworks. Day 2: We will sail to Cayos Limon. Snorkel on a sunken ship covered in multicoloured coral and surrounded by crystal clear waters. Anchor at this idyllic spot to enjoy sunset and spend the night. Day 3: After breakfast, we set sail to Kuanidup. Stroll on a small island, inhabited only by aKuna family in charge of the cocunut palms. Swim and snorkel among the nicest coral reefs. Delicious fresh fish and seafood barbecue aboard. Day 4: We will pull up the anchor and set sail to Corazón de Jesús. 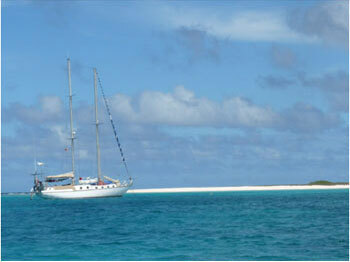 We will anchor on theway to enjoy swimming and snorkeling on another pristine coral. Visit of a traditional Kunavillage. Day 5: Guest’s disembark soon in the morning, to take the flight back to Panama City. Note: we offer custom made itineraries and also sailing tours to Bocas del Toro.